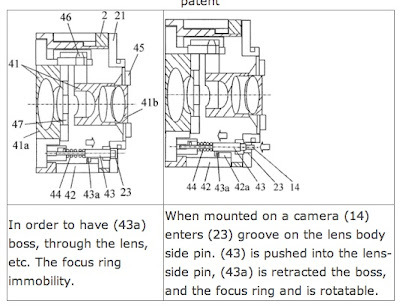 Egami, the Japanese Photography Blog has discovered an interesting patent filed by Canon. When mounting a lens on a camera body, and holding the lens, the rotating focus or zoom ring can make the operation more difficult. Imagine you have to switch lenses fast, the rotating elements of the lens can slow down the mounting of the lens. 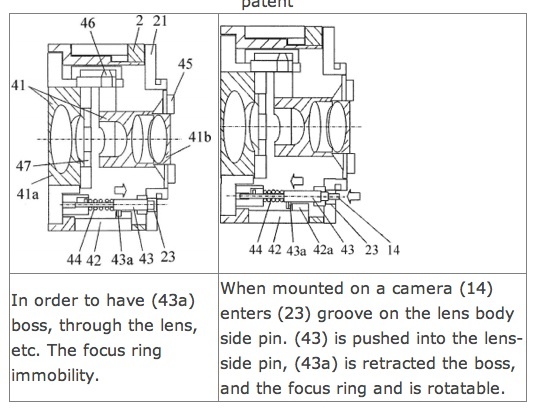 The Canon patent is for a new lens mount type that blocks all rotating elements of a lens when the lens is not mounted on a body, hence making mounting the lens easier (and faster). This is achieved by pins on the lens mount that block the rotating members inside the lens barrel. The new mount type is compatible with existing EOS mounts. That means lenses that will feature this new kind of mount can be used with existing EOS bodies. You can read the original article in Japanese here. Frankly, I think this is a solution in search of a problem. As I have pointed out in my earlier posts, often times many patents never turn into marketable products. They are used to deny Canon's competitors from exploiting the same or similar technology in their products.